"O Krishna, what are the symptoms of one whose consciousness is merged in transcendence? How does he speak, and what is his language? How does he sit, and how does he walk? When we glorify Srila Prabhupada, we often describe his extraordinary achievements—the number of temples he opened, disciples he initiated, books he wrote, and so on. That is surely one way to glorify him. But it is incomplete. Underlying Srila Prabhupada's achievements, after all, were his remarkable spiritual qualities. And so another way to praise His Divine Grace is to focus on them and show how he expressed them in his person. Srila Prabhupada was full of saintly qualities, and we want the whole world to take note of them and join us in honoring him during his Centennial celebration. Many will find the photographs in Acharya familiar. But there is no harm in this, for the goal here is not to publicize archival pictures of Srila Prabhupada but to invite the reader to peruse his face more carefully, to reflect on the inner moods and deep meanings it conveys. In short, Acharya teaches us to go beyond casual viewing and contemplate Srila Prabhupada's exemplary qualities reflected in his visage. Acharya's compiler selected only twenty-six pictures of Srila Prabhupada, to match the twenty-six devotional qualities listed in the Chaitanya-charitamrita. But there are thousands of photographs of Srila Prabhupada, each conveying one or more of his qualities. From now on, whenever we see a picture of Srila Prabhupada, we should try to understand which quality or qualities it reveals. An acharya is a transparent via medium between Krishna and the material world. Srila Prabhupada came here to show us Krishna, the reservoir of all transcendental qualities. Because he was fully absorbed in Krishna consciousness, he possessed these qualities to the greatest degree possible for a living entity. Srila Prabhupada often quoted the maxim "The face is the index of the mind." Therefore, by contemplating photos of Srila Prabhupada and reading about him, we deepen our consciousness of the Lord. Increasing our Prabhupada consciousness increases our Krishna consciousness. An expert speed reader could go through Acharya from cover to cover in five minutes. But we recommend a 'deep reading' in a contemplative mood, for only then will one be able to see Srila Prabhupada's qualities in the pages of this book. We could read just one page a day and deeply meditate on one of Srila Prabhupada's attributes (dedicating two days to a few pages would fill out a full month). The compiler and the publisher of this beautiful work will consider their efforts fully fruitful when the reader, having imbibed Srila Prabhupada's matchless qualities from its pages, will deepen his or her appreciation for his achievements, his mission, and his teachings. While working to gather just the right photos, matched with just the right quotations, for this publication, I shared my concept with a friend. I was somewhat unprepared for his response. Lost in the clouds of my artistic trance, I was suddenly brought back down to earth by the words, "I'd be careful about investing money in a project like that if I were you." "Well, you know how devotees are," my friend explained. "They only get excited about something if it is new. You're using pictures everyone has seen before. Devotees may look at it on the bookstore shelf, they may even think it's a very nice presentation, but I doubt they will buy it. After all, they can read the whole book in five minutes! These words forced me to rethink the entire project. What was I attempting to convey about Srila Prabhupada? Could such a message be effectively presented through this medium? As it turned out, my friend's words were actually a blessing in disguise. The book's format did not change, and I even stuck with the same "old" photographs of Srila Prabhupada. But what did change in my rethinking of the project took place on a more subtle level. I came to a more clear understanding of the raison d'etre of the project. It became crystal clear to me that this book is all about inspiration. I have always been inspired by the transcendental qualities and character of Srila Prabhupada and all great Vedic personalities. Just remembering the description of Srila Prabhupada boldly walking up the gangplank of the Jaladuta, on his way to preach in an unknown land, alone but completely dependent upon Lord Krishna, is enough to send shivers up my spine. Isn't this the same sort of resolute determination displayed by Lord Ramachandra when he received the order from his father to go to the forest? Yes, the exhibition of transcendental qualities and character are what encourage me to continue my struggle to become Krishna conscious. How is it that a devotee is inspired to read or hear of the activities of the Personality of Godhead or a pure devotee over and over again? Why doesn't it become hackneyed or old? It is because such activities are enacted from the deep bedrock of transcendental qualities and character. These activities are motivated from such depths of spiritual purity and love of God that newer and newer realizations are revealed to one who with greater and greater enthusiasm delves deeply into them. Inspiration is that intangible essence of this reciprocal exchange between the Lord, His pure devotee, and the aspiring devotee. Because I am thus inspired by meditating on Srila Prabhupada, my attempt herein is to share and exchange that inspiration with you. Acharya is constructed around the twenty-six qualities of a devotee as presented in Sri Chaitanya-charitamrita. I have selected photographs which may be well known but, more importantly, which I feel capture a particular transcendental quality of Srila Prabhupada's character. The quotations, which are elaborations on each of the twenty-six qualities, are from Srila Prabhupada's books, letters, lectures, and conversations, and are chosen specifically to accent the matching photograph. Srila Prabhupada once said that the face is the index of the mind. In order to fully appreciate the presentation of Acharya, I encourage you to deeply study each photograph: look into Srila Prabhupada's eyes; examine his facial expression, try to understand the message of his countenance. If you delve into each photograph in this manner, letting the selected quotation be your guide, I am sure the inspiration which I wish to convey will make Acharya a newer and newer experience each time you pick up the book. There is also another way in which Acharya can be a continually fresh experience. This particular combination of photographs and quotations is certainly not intended to represent the exclusive expression of the twenty-six qualities of a devotee. Consider this presentation a starting point for your own individual meditation on Srila Prabhupada. Each time you see a photograph of Srila Prabhupada, why not try to see it in a new way? Try to relate the photograph to a particular instruction of Srila Prabhupada's, something mentioned in his books, or something he said in a lecture. You may find inspiration in your life where you least expect it. 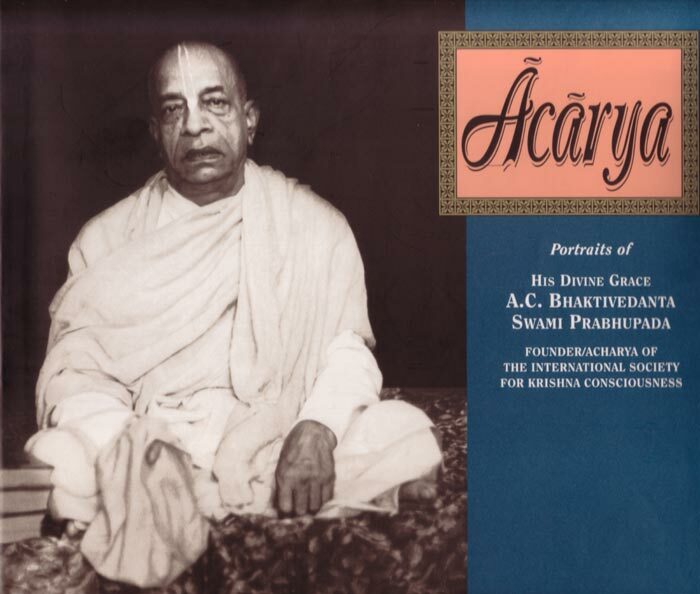 Finally, I would like to acknowledge that much of my own inspiration for Acharya comes from His Holiness Satsvarupa Dasa Goswami's book The Twenty-Six Qualities of a Devotee. My personal association with Satsvarupa Maharaja over the years has always been complementary to my devotional service, and it is my hope that Acharya and The Twenty-Six Qualities of a Devotee will complement each other in the task of inspiring devotees everywhere. I would also like to thank the book's designer, Rama Prasada Dasa, whose visual artistic skills brought the project together in its final form. Devotees are always merciful, humble, truthful, equal to all, faultless, magnanimous, mild and clean. They are without material possessions, and they perform welfare work for everyone. They are peaceful, surrendered to Krishna and desireless. They are indifferent to material acquisitions and are fixed in devotional service. They completely control the six bad qualities—lust, anger, greed and so forth. They eat only as much as required, and they are not inebriated. They are respectful, grave, compassionate and without false prestige. They are friendly, poetic, expert and silent. "That is the way of Krishna consciousness. Pure devotees are so absorbed in thought of Krishna that they have no other engagement; although they may seem to think or act otherwise, they are always thinking of Krishna. The smile of such a Krishna conscious person is so attractive that simply by smiling he wins so many admirers, disciples, and followers. "Personally, I am nonentity; I have come here on the order of my spiritual master, and he has kindly sent all you boys to assist me. So whatever is being done, there is no credit for me, but all credit goes to my spiritual master; because he has arranged everything, and I am simply trying to abide by his order. "Devotees always humbly offer respect to everyone, but when there is a discussion on a point of sastra, they do not observe the usual etiquette: satyah bruyat priyah bruyat. They speak only the satyam [truth], although it may not necessarily be priyam [pleasing].